Grey Manor; England; Lives with his parents. 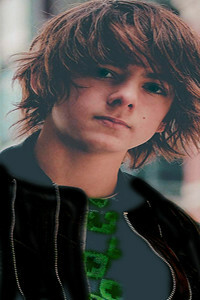 Christoph Alexander Grey is a Pureblood Wizard whom was born Eleven years ago to Thaddious and Vivian Grey. Raised in the Pureblood lifestyle he was pushed through typical things like etiquette and the like, his mother Vivian being a stickler for such forms of politeness and insisting they be drilled into him from a young age. He's been tutored in a handful of things prior to beginning his schooling which he hoped to be soon. These things include the basics of potions and light charms work as well as other things. He has a fascination for Divination and has read a couple books on the subject. Though his parents seem to smother him with affection when they're around their respective careers and social lives keep them busy and Christoph has grown up with mostly House Elves for company in his hours of loneliness. Something he, despite not being the nicest child and having a rather cold and aloof demeanor, hopes will change when he starts school. Christoph's head turned sharply at the voice that if he were honest? Grated on his ears. The rudeness of addressing someone in such a way not helping the young girl's case. He was odd. That much he knew for certain. Always told he acted in a way that differed from most eleven year olds and he did. He acted slightly older and due to him being slightly taller than most of his fellow children? He often was mistaken for older. Cold blue eyes took in the young girl with distaste and she was young. He wasn't impressed. He'd been standing off to the side of things reading his book for the upcoming year, he was hoping to get his Hogwarts letter. However this girl who...from what he could tell, was alone. Where were her parents or other family? Then again people may ask the same of his own mother and father. They were too busy to accompany him to the park. "No thanks. I was busy reading before you interrupted me. Might I suggest finding someone...and actually asking politely next time? Most people don't like 'Hey You' or things like that. They prefer to be asked their names and for it to actually be used." He drawled before ignoring the girl in favor of returning to his text.